Thank you to Liz Guiney and Mary O’Connell for sharing their 2017 NANANordic experiences coaching in Ambler and Kiana! 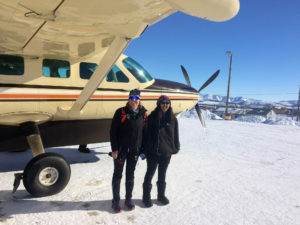 At the beginning of April, Green Racing Project skiers Mary O’Connell and Liz Guiney (myself) spent a week in Northwest Alaska with NANA cross-country. 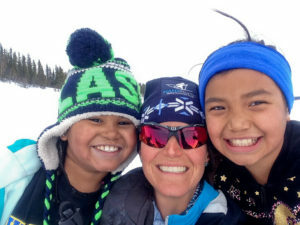 Every year NANA cross-country (and its affiliate Skiku) sends hundreds of volunteer coaches, hailing from Alaska and beyond, to native villages in northwest Alaska to coach cross country skiing. Getting the opportunity to share our favorite sport with a village-full of Inuit kids and adults was truly an amazing experience. While Mary and I both coached the same week in the NANA region, she spent her week in Kiana, while I was several hundred miles more inland in Ambler. We couldn’t possibly cover all of our experiences from the week in one blog, so here are a few of our stories and photos. Day One (Sunday): Mary spent all day flying from Vermont to Anchorage, which is no small travel feat! 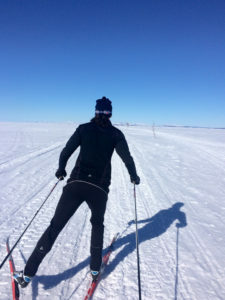 Liz finished her final race of the season, a 30k at Spring Series in Fairbanks, then later that day hopped on a plane to Anchorage. We reunited at baggage claim in the Anchorage Airport, took a short shuttle ride to a nearby hotel, and promptly collapsed in the nearest bed. 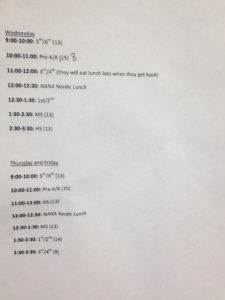 Our schedule for the end of the week. Coaching at NANA is no joke, one day I spent almost 10 hours outside with boots on my feet! This schedule doesn’t include after school skiing, with starts at 3:30 pm and goes until the kids get tired. Hint- the kids never get tired. Kindergarten, all lined up and ready to go! Mary – I arrived in Kiana along with another coach for the week and, like Liz, immediately started teaching the 5th and 6th grade PE class. During the entire travel day(s) to Kiana, I was getting increasingly more nervous about what the week was going to hold. I had only been to Alaska once before, and had definitely never flown on a bush plane (for some reason, motorized travel is one of my only fears). But the moment I started skiing around with the kids, learning their names and little bits about them, I realized that I was in for the best experience of my life. We spent the day to introducing each grade to skiing through games and going on tours around town. By the end of it, I was exhausted, but so excited for the remaining four days. Teaching Kevin, Zada, and Gazara (K and 1st grade) how to ski!! The tips of Kevin’s hair are dyed silver, and he came to every after school ski (the only one of his age group!) Brighton (in the background) was our high school helper all week – and he was great!! 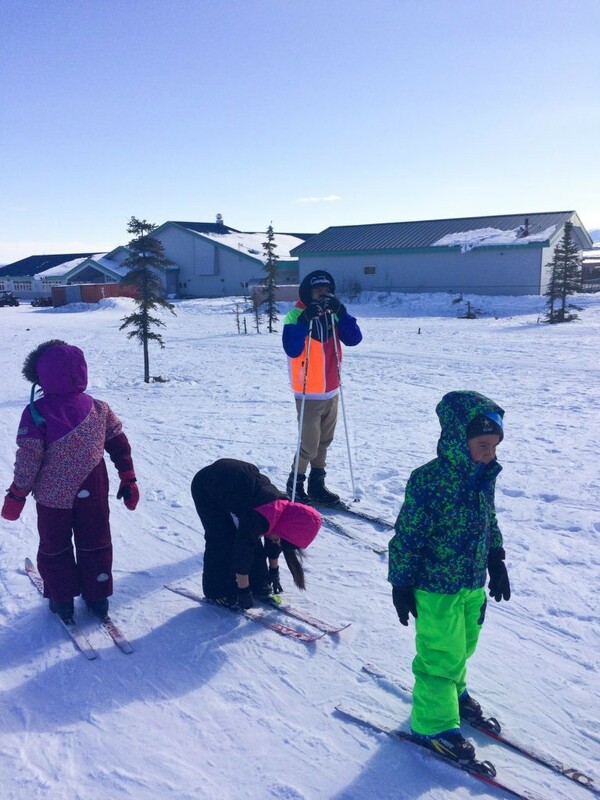 He is really good at skiing and good with the kids. Thanks for the help, Brighton! It was Caitlin and Courtney’s (high-schoolers) first time on skis this week, but they showed up every day and were so eager to get better and learn something. I enjoyed starting the days with them! fly in from overhead. The best part was that in this age group, the girls skied way farther and faster than the boys did. I’m all about female power. 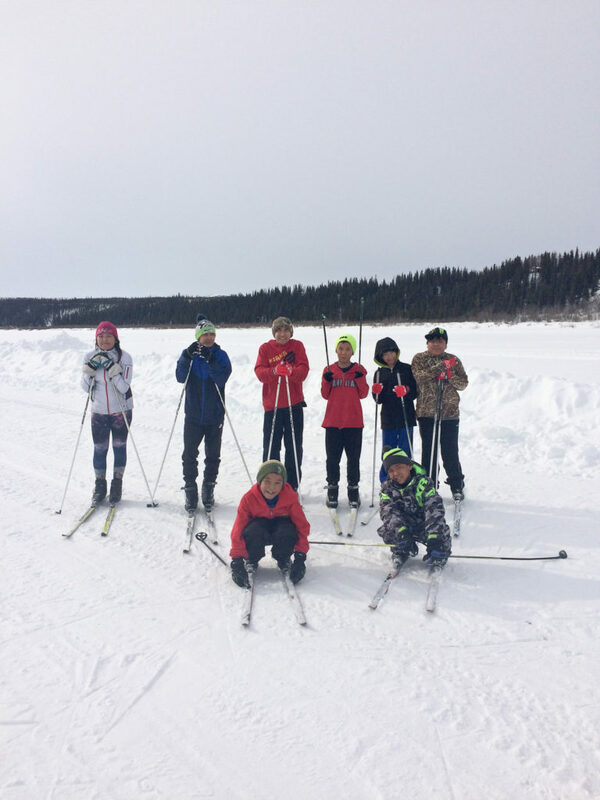 After school, we had every usable boot, ski, and pole checked out, and we took the entire group out on the frozen Kobuk river to ski towards Shungnak, a village 30 miles away. One of the pre-K boys who was very new to skiing made it down on the river as well, and it took over an hour of coaxing, towing, and taking skis on and off to make it back to the school. Happy to report that there were no tears! Mary – This day seemed to be the longest one. I think the effects of the first day were catching up with me, and our coaching group was still nailing down the perfect system of handing out skis, boots, and poles all day long. We set up a tricky downhill slalom/obstacle course for all the grades, and it was awesome to see so many kids send it through the gates, and many others just get better and better as the hour went on. The after school group skiing was definitely the best part of every day. We would have 15-20 kids of all ages show up, motivated to go adventuring to some place new. 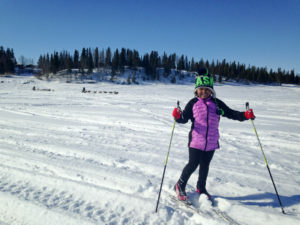 Like Liz, we were able to ski on the frozen Kobuk river quite a bit; also known as the “ice road.” Kiana is about 25 miles from the Noorvik Village, and without fail, every day the kids wanted to ski to Noorvik. In fact they talked about Noorvik ALL THE TIME. 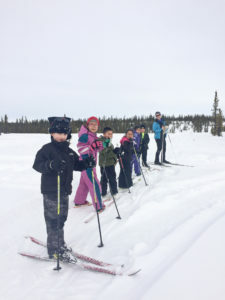 We couldn’t figure out what was so special about Noorvik, until a teacher told us it translates to “a place to go.” Well, aha, that’s why they always wanted to go there. I can’t say that we ever made it to Noorvik, but we sure tried. And the views never disappointed. 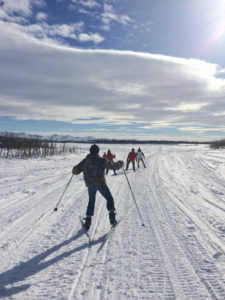 Attempting the ski to Noorvik after school. I couldn’t get enough of the after school adventure skis. Reminds me of all the times that led me to fall in love with the sport. 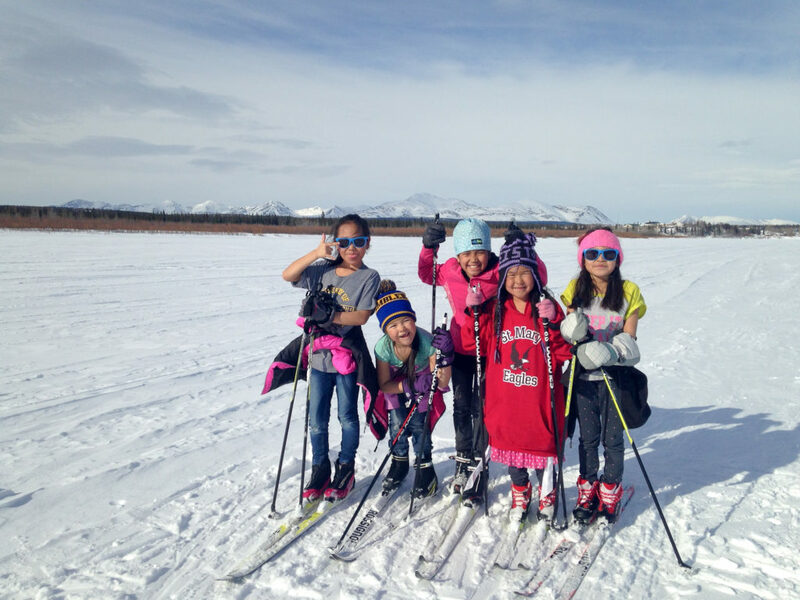 K and 1st graders out for a ski tour. 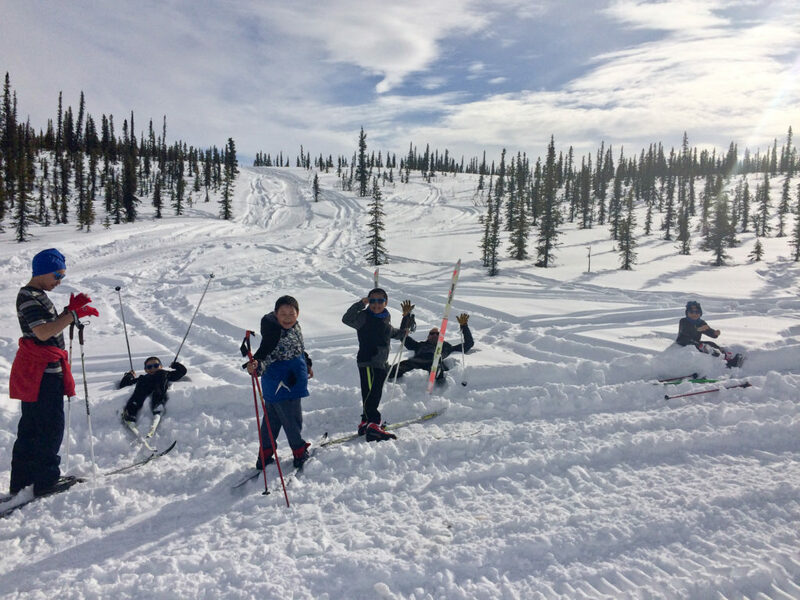 This group was awesome, and despite spending more time on their bums then on their skis, they were always eager to go further! Playing Stones ALL DAY!!! Good thing I get so much practice with all the Craftsbury Juniors. something new and different. And depending on how much time was left, I taught all the kids how to play Stones (a Craftsbury junior favorite!!). I had a blast playing the game with the kids, and I think most of them enjoyed it too. Games are such a good way to get kids better agility practice on their skis, and Stones is the perfect game, because it’s almost never ending usually everyone is a winner! 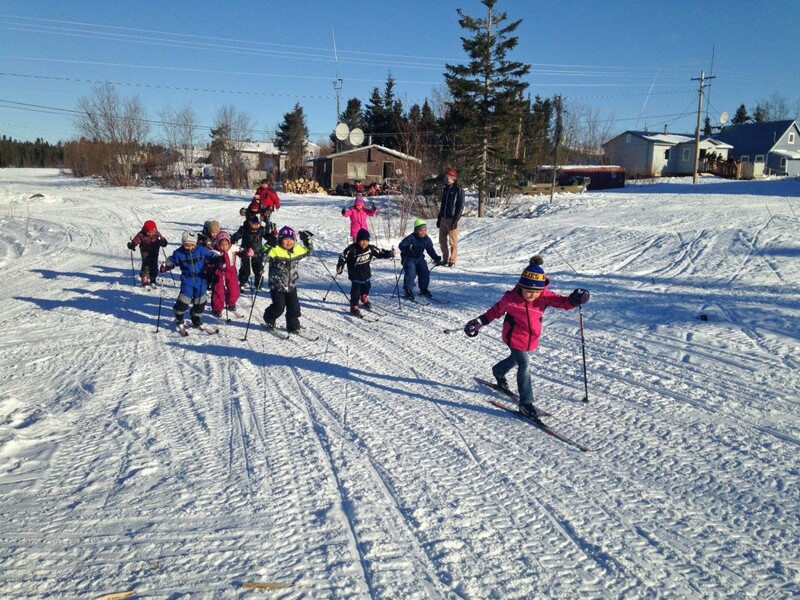 My favorite part of the day had to be taking the Kindergarten and 1st graders out for a ski. I was with the faster group and I just skied behind the kids videoing the whole way. I’m not sure I had even put on skinny skis when I was that age, and it is tough to navigate those things!! But every time one of the fell down (which was probably more than you might guess) they would just pop right back up no problem. The after school group destination for Wednesday was the West Lake Ridge. I think we got a bit lost on the way, but nonetheless had a great time exploring some snow mo (snowmobile nomenclature) trails in the warm sun. One thing I appreciated throughout the week was the amazing skiing we were able to do, despite not having anything resembling a grooming machine. With the very dry snow that falls, the snow mo’s pretty much create a perfect trail to ski on. After school ski out to West Lake with a fun, motivated, and happy crew. We had to take a quick break in the sun before skiing all the way back to school. And Kiana had some incredible trails!! Lots of rolling hills down to creek beds and rivers, up hills to see incredible views, and weaving through the forest. I learned where all the best berry patches exist in the summer and where all the good hunting spots are. You can ski on the Village roads as well, but those tend to be a bit icier and less forgiving when the kids inevitably fall. As a side note, I always encouraged kids to fall, because that’s part of the game. Many of the kids would show up so scared to fall down, having been told in the past “don’t fall, don’t fall,” buy hey, even I still wipe out when I’m skiing. Not even on cool downhills or anything. It’s important to just know how to get back up! Smiling Kaley, happy to be out skiing in the sun! 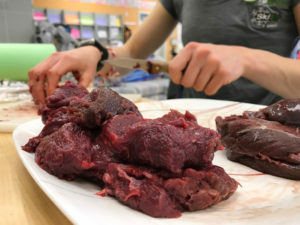 Fresh caribou meat that one of the teacher’s aides gave us. We found a few hairs (typical of fresh game meat), but overall it was delicious. another 10 hour day on skis, it was one of the more delicious things I’ve ever tasted. After dinner, my fellow coaches and I ventured over to the tribal council building, where we heard there was a dart competition going on. 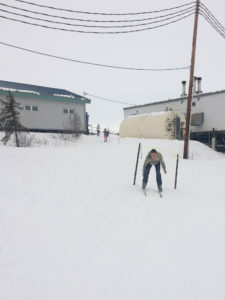 With a little more digging, we found out that the darts were actually a way to bet on the Kobuk 440, a sled dog race that was coming through Ambler over the weekend. We felt like we might fit in with the locals a bit more if we threw some darts, although I can’t say our hit percentage was very high. I became the crowd favorite after landing two darts in the floor, one in the rafters, and, shockingly, one in the dart board (although not on a musher’s name, which was the ultimate goal). Obstacle course/station day with the second graders. Getting kids to pose was always entertaining. Mary – As the final day of skiing before Friday’s big races, we set up a team obstacle course/station race. 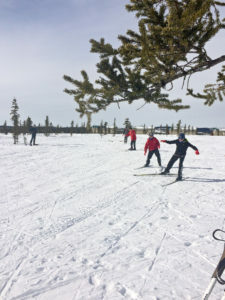 Each team had to complete an activity on skis before moving to the next challenge. Then the first team done with all four stations won!! 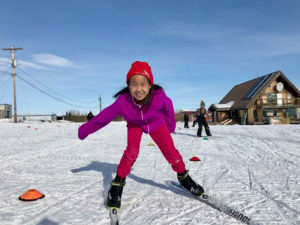 This was pretty fun for coaches to come up with the ideas, and then to watch the kids really test themselves and see that they were capable of much more than they thought on skis. After school, the 7th and 8th grade boys wanted to ski to the Old Village. I had yet to ski here, but the rule was you couldn’t be younger than 12 to go because of a downhill that was out there. I was a bit skeptical to just be following these boys to some downhill I’d never seen and once we got there, I made all the kids go down the hill before me so I knew what I was getting into. And it was so much fun!! It’s probably no secret that downhills are my strength and I absolutely love going super fast. I think I get that adrenaline rush need from my cross-country Combined days. At the bottom of the hill there was a jump, or a “fly”, which I really couldn’t avoid. (Though I don’t have any pictures so I can’t prove it). After I hit the fly, the boys decided they had to too. Not everyone landed, but there were no injuries and only laughs. Afternoon ski with the 7th/8th grade boys out to the old village. The skiing in Kiana is absolutely incredible! The rest of the ski was beautiful, one of those skis where you remember exactly why you ski. For me it is because of the challenges I face and push myself through every day, the things I learn about myself, the cool places I get to travel to, and the people and communities I meet along the way. I felt like all of that was summed up into this one ski. 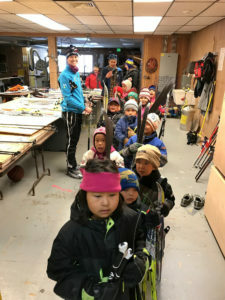 Liz – Usually race day happens on the last day of NANA cross-country, but because we knew the Kobuk 440 would be coming through town on Friday, Thursday was our race day!! We made it super official with bibs, course marking, and prizes, which were either NANA cross-country buffs, or GCI gloves, depending on the age group. We encouraged everyone to participate, even if they didn’t think they had a chance of winning, just to show that racing isn’t all about who wins or loses, and it’s important to cheer for everyone as they finish! The most exciting race of the day may have been the pre-K/kindergarten sprint drag race. Anaya, the clear favorite, had a tangle out of the start, and she and Clara battled it out and eventually tied. Phew. Because we wanted some of the older kids to do a longer race course, but didn’t have a lot of time to set up a long course, we did their race scavenger hunt style. They started near the school and had to ski out and find one of the coaches, pick up a bean bag from them, and then return it to the start first. This made for interesting spectating because it wasn’t necessarily the fastest kids who would find the coach first! They had to be smart and good about their route finding too. I also got a big kick out of seeing who won each age group- in the high school race, one of the older high school boys who hung back in every practice was way out in front for the race and won by minutes. Some of the parents came out to cheer too, which was great for us as the locals got to see what the “skiing people” had been doing in PE classes all week! After school, we had probably our shortest ski of the week since we finally accomplished a big goal- tiring the kids out! It was a beautiful day though, and I loved leading a group of girls out to “tundra”, where they usually didn’t go. They warned me to look out for bears and moose, but luckily we escaped without seeing any big wildlife. Serious faces on the start line! And even more inspiring to watch the kids who could hardly go 50m without face planting on Monday make it around the entire course and surprise all the coaches. 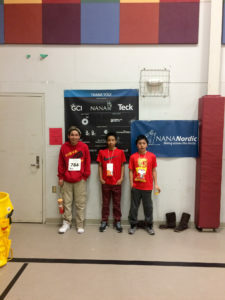 The podium on race day- looks like the red team from Kiana swept it. The race of the day went to a 4th grader Lucy who would ski with the slowest group every day (she was there everyday, however) go from the gun and battle a a close race to take away second. And the hug I got from her after felt really special. My greatest achievement of the day was learning nearly every kid’s name (close to 70 kids! ), and racing in the 7th and 8th grade category and just barely squeaking away with the win. (The 7th/8th grade course was the longest/most confusing so they needed a pacer). Upon completion of the races we handed out our crafty prizes, and then packed up all the equipment to catch our afternoon flight back to Kotzebue. Liz – With our race day out of the way, Friday was actually a pretty easy day. 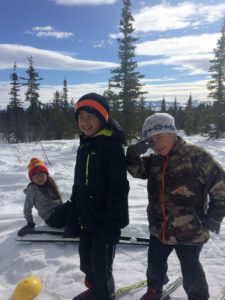 Most of the kids were checked out of school so they could watch the Kobuk 440 dogsled race come through town, and help with the race (each town supplies food, water, lodging, and dog bedding for the mushers). creativity, and the nordic coach’s carpentry, we got a somewhat workable version of the wax bench and were able to get through the fleet of skis there. 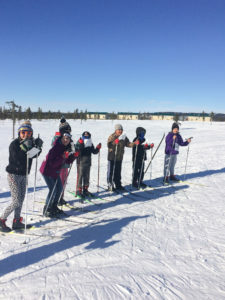 This was great, since some of the kids were complaining that their skate skis wouldn’t slide- they were collecting snow on the base, which obviously puts a big damper on skating! Beautiful sunrise every morning on my walks/run to get the day started! Skiing across the sea ice, with Kotzebue far far in the distance! At the end of the week I was physically exhausted. After being on skis for almost 9 hours a day for 5 days with a short lunch break, tying countless number of shoes, and passing out equipment all day long, my body was tired. But emotionally and mentally, I’d never felt more spirited. 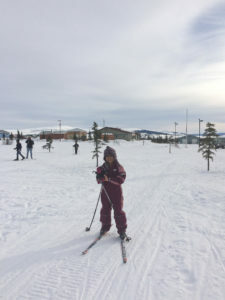 I think I can only remember two instances of tears (not from me, the children), and had to do little coaxing to get the kids to ski up the final hill, which was truly inspiring. The kids and the rest of the community members we met were so kind and welcoming to us, so eager to learn, and motivated to continue skiing once we departed. I do hope I get the opportunity to return to Kiana, or any other village for that matter. I would do it all over again in a heartbeat. 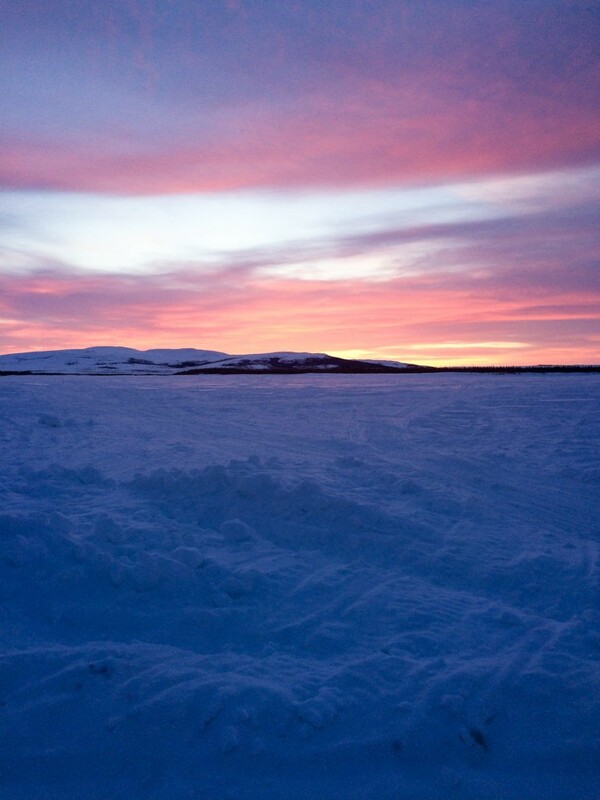 Liz – On Saturday morning, I hopped back on a plane to get to Kotzebue. 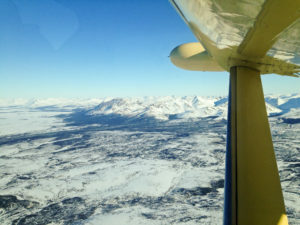 Unlike our flight in, this flight had perfect, clear weather and we could enjoy the beautiful views of the Brooks Range all the way to Kotz. It was awesome to meet up with Mary and the other coaches, trade stories and do a little skiing on our own. After the week of coaching, I was perhaps the most physically exhausted I had been in a while, including after the race season. However, like Mary, I was also inspired and invigorated. Trips like NANA cross-country just reinforce my belief that it’s love of the sport that got me involved in nordic skiing in the first place. While I spend most of my time training and racing, it’s also important to share that love with other people, because it validates what we do. Watching kids go from total frustration at the beginning of the week to figuring out that they actually can ski, and their skis can take them new places, is insanely rewarding. The best was looking out the window after our ski program was done for the day and seeing groups of kids skiing around town, going from house to house, stopping at the store, or just enjoying the trails. 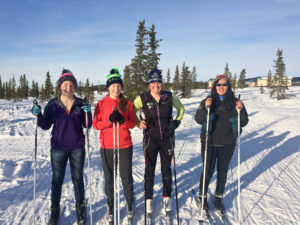 As they gained confidence, it was really fun to actually go out for longer skis with them, and just chat while we skied- not that different from when I work out with my friends or teammates back home! I hope to get back to coach at NANA again in the future, in the meantime I will be eagerly awaiting the newest crop of skiers and racers from Ambler, there’s some big potential there.